Home / blog / Detox your Polluted Lungs, Naturally! Detox your Polluted Lungs, Naturally! Say no to air pollution. Avoid being a victim! If studies are to be believed, air pollution is said to be one of the most dreaded form of pollution that takes millions of lives every year. It occurs when mixtures of harmful substances like chemical residues, biological molecules, and several other harmful particulates are exposed to the Earth’s atmosphere. These may cause different kinds of problems for human health like allergy, diseases or even death. It may also be responsible for damage to crops, water bodies, animal health and other challenges for living organisms. Air pollution can be generated by both humans as well as activities. As claimed by the World Health Organization in 2014, around 7 million people died in 2012 due to severe air pollution around them. This was just a rough estimate as reiterated by the International Energy Agency. Breathing polluted air can lead to lung cancer which can be very hazardous. We cannot avoid our day to day interactions with such pollutants and the major pollution. But we can definitely detox ourselves and shed off all the toxic, hazardous matters directly or indirectly consumed. Two major reasons behind the pollution problems prevailing around are indoor air pollution and poor urban air quality as listed in the 2008 Blacksmith Institute World’s Polluted Places report. Majority of air pollution is generated due to the usage of energy and production processes. Gases and chemicals released from burnt fossil fuels. The most destructive aftermath of air pollution being climate change, in the form of methane and carbon dioxide, air pollution also results in praise of earth’s temperature and smog when the weather is warmer as compared to other days and ultraviolet radiation is at its peak. The climatic change also leads to the emission of allergenic air pollutants like mold and pollen. As pollution of all sorts is at its peak owing to the hiking industrialization, private vehicles and several another day to day activities, in order to safeguard your kids from the harsh effects of air pollution, you can limit the time your children spend outside in the open area exposed to dust, smoke, and grime. Wear sunscreen as it is strictly recommended by dermatologists to protect yourself from the harsh ultraviolet rays. We cannot avoid our day to day interactions with such pollutants and the major pollution. But we can definitely detox ourselves and shed off all the toxic, hazardous matters directly or indirectly consumed. Nimba nature cure village is your ultimate destination for all such detoxifications which also include lung detoxification. Nimba nature cure village is your ultimate destination for all such detoxifications which also include lung detoxification. 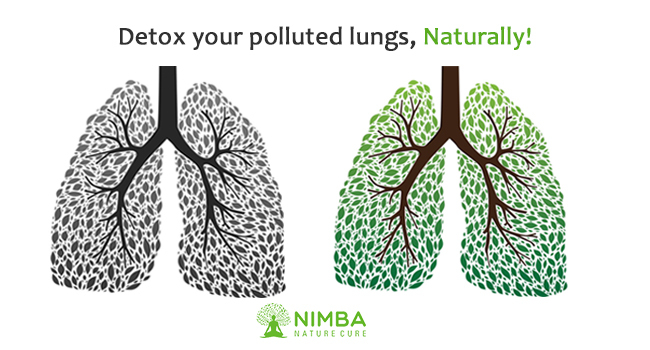 Nimba Nature Cure Village provides different packages of detox treatment where you can opt for detox treatment for air pollution or detox treatment for lungs. These packages are tried and tested and claim to give you 100% relief from toxic elements through the detox treatment. Implementing age-old ayurvedic methodologies and organic products for the detox treatment for lungs, these methods are claimed to work. If you are looking forward to a wellness tour, consider visiting Contact Us!